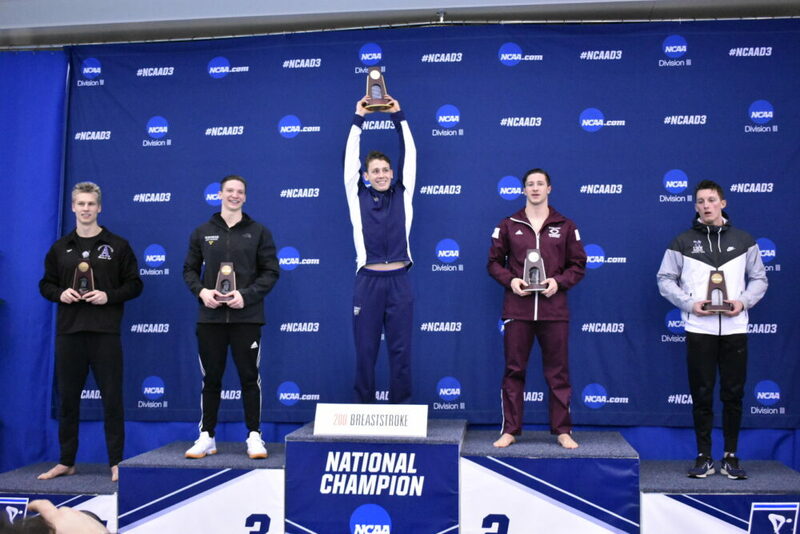 GREENSBORO, N.C. – Tanner Sonnek (Sr., North Mankato, Minn.) earned his second All-America honors on the final day, this time in the 200 breaststroke by placing third. His time of 1:58.88 broke the previous school record that he held by a tenth of a second. As a team, the Gusties men also took home 17th in the nation. Nolan Larson (So., West Des Moines, Iowa) started the meet for the Gusties in the 200 IM prelims and finished with a time 1:52.42 for a 29th place finish. Webster finished t-15th in the preliminaries in the 50 freestyle with a time of 23.52 and earned herself a chance to race in the Consolation Final. She then finished third in the Consolation Final with a time of 23.44 which was good for an 11th place national finish. Matt Allison (Jr., Grand Rapids, Minn.) and Sonnek then swam in the 50 free and took 26th and 55th respectively with times of 20.76 and 21.79. In the last Gustie event of the day, the men’s 200 yard medley relay team of Josh Muntifering (So., Buffalo, Minn.), Sonnek, Larson and Allison took 21st with a time of 1:33.00. The men’s 200 medley relay team of Allison, Sonnek, Larson, and Muntifering got day two started for the Gusties taking home 21st place with a time of 1:23.92. Webster then competed in the 200 freestyle and swam a lifetime best time of 1:53.54 to finish in 32nd place overall. Larson competed in the 200 freestyle as well and just missed the cut finishing 19th overall with a time of 1:39.59. The time was his second career finish in the 200 freestyle under 1:40.00. In the 400 medley relay, the team of Muntifering, Sonnek, Larson, and Allison took 20th with a time of 3:23.58 to finish out the day for the Gustavus. No Gustie swimmers qualified for the finals session on Thursday. Sonnek started the day for the Gusties with a time of 54.99 in the 100 breaststroke which was good for eighth in the prelims and secured him a spot in the finals. The men’s 800 freestyle relay team of Dutch Franko-Dynes (Fy., Minneapolis, Minn.), Muntifering, Larson, and Allison then etched their names in the Gustavus record books breaking an 11-year old school record in the event with a time of 6:43.69, sitting in third place. In the 100 breaststroke finals, Sonnek took home fourth place in the nation with a time of 54.39, securing his third consecutive All-America honor in the event. The men’s 800 freestyle relay team then finished with a time of 6:43.69 to take home an 11th place overall finish earning them All-America Honorable Mention honors. Saturday marked day four and Webster was back in action for the Black and Gold competing in the 100 freestyle where she placed 20th with a time of 51.47. Allison then competed in the 100 freestyle for the men and finished in 32nd with a time of 45.68. Sonnek then once again himself All-America honors reaching the finals of the 200 breaststroke with an eighth place prelim finish and time of 1:59.85. The 400 free relay team of Frank-Dynes, Muntifering, Larson, and Allison then finished the morning session finishing 15th with a time of 3:03.12. In the nightly finals session, Sonnek then competed in the 200 breaststroke finals and finished 3rd overall to lock up All-America status. Tanner finished the race in a time of 1:58.88 which breaks the Gustavus school record in the event.